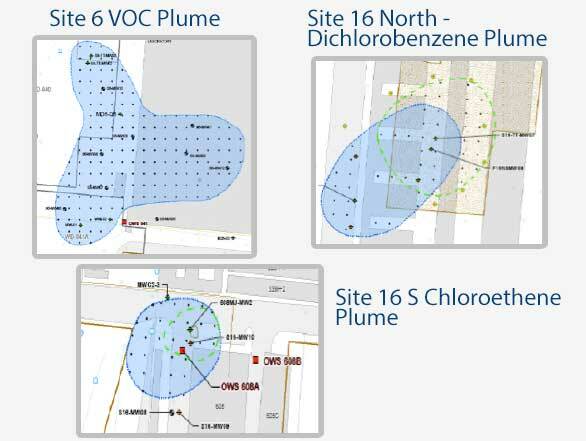 In Situ Chemical Oxidation of VOC and Dichlorobenzene Plumes - Noreas Inc.
NOREAS was involved in In Situ Chemical Oxidation (ISCO) of three shallow groundwater plumes at Former Naval Air Station (NAS), Alameda Point, California. The plumes were comprised of chloroethenes, while one of the plumes contained a mixture of chloroethenes and chlorobenzenes. The Record of Decision (ROD) for these plumes stipulated that ISCO would be the initial technology of choice, followed by polishing steps as necessary. ISCO had been previously used at the site and shown to only be effective at high contaminant concentrations. NOREAS performed a thorough review of the previous data, and concluded that ISCO using activated sodium persulfate was a viable option (this technology was not available during the pre-ROD effort in 2002/2003). One of the plumes had apparently shown a rebound 4 years after initial ISCO operations. Based on review of soil data, NOREAS surmised that this rebound was due to the ongoing presence of contaminants in the saturated soil after ISCO. Based on lessons learned from previous ISCO implementation at these sites, as well as other sites at Alameda Point, NOREAS proposed a close spacing (20 feet) of injection points. NOREAS prepared a Remedial Design/ Remedial Action Work Plan which was subsequently implemented at the site. ISCO injections were completed in May and June 2010, and four quarters of post-injection performance monitoring were completed in May 2011. Performance evaluation has been completed. NOREAS prepare a Remedial Action Completion Report to document all the activities. The data from the four sampling events indicated successful remediation in a substantial portion of all three plumes. Data from these events were used to design transition remedies as a polishing step and included enhanced in situ bioremediation and/or monitored natural attenuation. NOREAS had considered a sequential anaerobic/aerobic in situ bioremediation approach for treatment of residual dichlorobenzene isomers, which were not fully degradable under anaerobic conditions, and are recalcitrant under aerobic conditions. NOREAS provides scientific, technical, engineering, and construction management support to federal agencies, local governments, and utility companies, as well as a diverse group of private industries throughout California, Nevada, and Arizona.